General Electric just announced a groundbreaking program that will hopefully help reduce the amount of waste in our country’s landfills as well as prevent some toxic chemicals from getting released into our environment. GE’s program specifically is related to recycling refrigerators across the country. 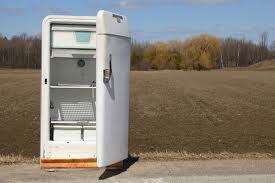 There are approximately nine million refrigerators thrown out in the United States every year. Many of these refrigerators can contribute to releasing dangerous chemicals such as hydroflourocarbons into the atmosphere. GE’s new program will attempt to cut these emissions down drastically. GE is smart to tap into an eco-friendly trend that is sweeping across the country. Consumers are now more likely to buy appliances like refrigerators from companies that are making a commitment to helping the future environment. GE’s commitment to properly recycling refrigerators as well as other appliances in the future is a big step for a major US corporation. Junk King is another corporation that has made a commitment to properly recycling household appliances. Every year Junk King helps consumers and businesses across the country get rid of their clutter and junk in an eco-friendly manner. Much of this junk consists of large household items that are hard for people to haul off on their own, such as refrigerators, washers, dryers, grills and hot tubs. Junk King’s professional hauling teams not only provide the man-power to whisk such items into their trucks, but they also have the know-how to bring these large items to proper recycling facilities. If you need to get rid of your refrigerator (or any other appliance) in an eco-friendly manner simply call Junk King at 1-888-888-JUNK or book an appointment online. This entry was posted in junk hauling, Pick Up Old Furniture, Recycling, Refrigerator Disposal, Refrigerator Recycling and tagged appliance recycling, get rid of your refrigerator, recycle your refrigerator, Refrigerator Disposal, Refrigerator Recycling on February 23, 2011 by Junk King. Last updated February 23, 2011 .